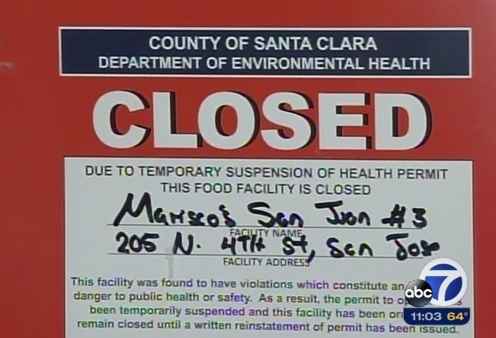 The Santa Clara County Health Department has closed Mariscos San Juan, a San Jose, California seafood restaurant due to a Shigella food poisoning outbreak that has sickened more than 90 people. Shigellosis is an infection caused by Shigella bacteria. Symptoms usually appear within 1-2 days after infection. Diarrhea, abdominal pain, and fever are common symptoms. Children and immuno-compromised people are most at risk of infection. Shigella complications are rare, but they can be serious. They include Hemolytic-Uremic Syndrome (HUS) that can cause acute kidney failure and reactive arthritis. Direct contact with an infected person. This is the most common way it is spread. Unsanitary food handling (indirect contact) by an infected person. Imported produce that may be contaminated with polluted water. Diarrhea can cause dehydration, which can be treated with fluids. Serious cases may require additional medical treatment such as antibiotics. Why Should I Worry About It? Shigella is prevalent, causing about 500,000 cases annually in the U.S.
Shigella bacteria are also developing resistance to many common antibiotics, which makes the condition harder to treat and more likely to spread. Shigella victim Greg Meissner filed a lawsuit against the restaurant. Given the number of people infected, more will likely follow. Recent news stories illustrate that bacterial food poisoning is a recurring, high cost, sickening (and in some cases, deadly) problem that requires investing in prevention. Additionally, according to the Centers for Disease Control and Prevention, the 2009 salmonella incidence rate was 15.19 cases per 100,000 population, which is more than twice the National Health Objective of 6.8 cases per 100,000. Elizabeth Hagen, the Undersecretary for Food Safety at the U.S. Department of Agriculture, noted that the incidence of E. coli O157:H7 infections has decreased, demonstrating that more stringent regulation and efforts by meat processing companies in particular have lowered contamination at the slaughterhouse level. However, as the recent outbreak in Germany of the world’s deadliest E. coli tragically illustrates, “new and ‘highly infectious and toxic‘” E. coli strains are emerging from a source(s) that is still unknown. Compounding the human tragedy, some businesses that sell fresh produce have seen their sales fall 35 percent since the outbreak began. EU farmers’ losses are estimated at $611 million per week. Former FDA Commissioner David Acheson has opined that an outbreak like the current one could happen in the U.S.
A .pdf copy of the guide can be downloaded here. The 476-page document provides an organized and comprehensive overview of how to identify potential hazards, determine whether they are significant, identify critical control points to reduce the hazard, and develop a control strategy (which includes setting critical limits, establishing monitoring procedures, establishing corrective action protocols, record-keeping, and verification procedures). Food Processing Companies, Restaurants, and Foodservice Providers: Do You Have a Current Food Defense Plan? Is your company implementing plans to protect its products from intentional harm? Reducing this risk helps protect your customers, your employees, and your business. What is a Food Defense Plan? A Food Defense Plan is a written plan to identify, address, and minimize the risk of intentional harm to food, such as deliberately adding pesticide to ground beef sold for human consumption. Why is a Food Defense Plan Necessary? The U.S. Department of Homeland Security has determined that the food and agriculture industry is one of the nation’s most critical elements of infrastructure. This trillion-plus dollar industry may be vulnerable to attack. How Can My Business Develop a Food Defense Plan? Preparing a Food Defense Plan requires identifying potential vulnerabilities, preparing a written plan to minimize them, and verifying the effectiveness of the food defense measures. The FDA and USDA have free food defense plan development and training resources available. The FDA has published this quick-and-easy four-step guide to food safety while preparing food for your Super Bowl party. First, wash your hands. (I know, this seems so obvious, but the problems that are literally right in front of your face are the ones that so many people overlook.) Second, keep raw and ready-to-eat foods separate to prevent cross-contamination. Third, cook foods thoroughly. Finally, keep in mind that it’s always better to prevent problems than to respond to them. (Perhaps the FDA should have put this step first.) The site includes other food safety links to help address specific food safety questions. In any event, enjoy the game.